Comprehensive review of Xen Tan Fresh Tanning Mousse. See what real experts and actual users have to say about this self tanning product. After testing, I really liked Xen Tan Fresh Tanning Mousse so I gave it 3.5 out of 5 stars. This mousse produces a very natural, medium shade tan. I look sunkissed and bronzed. The smell is enjoyable; it smells very fresh and citrusy. I didn’t like the lack of guide, because I ended up missing a few areas when I applied it. This product is also on the pricier side at $48.00 a pop. But overall, I enjoyed this self tanner for the most part. 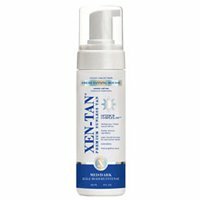 Xen Tan Fresh Tanning Mousse is a white, fluffy foam. I was surprised when it came out white in color, as most mousses are dark. The texture is very silky and smooth. Applying this mousse is very easy and simple, but you do have to be careful not to miss any spots. I used a tanning mitt even though the product doesn’t have a guide. I like using one just to ensure even application and make sure the product is blended well. The trickiest part when applying Xen Tan Fresh Tanning Mousse, is making sure you don’t miss anywhere because there is no guide. I actually prefer my mousses to have a bit of a guide at least so I can see where I’m applying them. I was very happy with how quickly this mousse dried. It dried in less than 20 minutes and my skin felt sooo smooth as it dried. Whatever they have in there is super hydrating and I loved how my skin felt. The nice thing about having no guide is you don’t need to worry about staining anything during the drying process. Xen Tan Fresh Tanning Mousse has a very clean, fresh scent (imagine that!). It smells like citrus, I really enjoyed the smell. I couldn’t smell any DHA as I applied it. As the color developed, I couldn’t smell and DHA, but the nice citrus scent faded away. The instructions say to leave this one on for at least three hours before showering. I prefer to leave mine on for longer to get a deeper tan. After I showered it off, I had a very pretty medium shade tan. For a dark tan, you’ll need to apply one more time. I loved the way my tan looked; it was very natural looking. The only downside was there were a few areas I missed due to lack of guide. This self tanner lasted about 4-5 days before I needed to reapply. As it faded I became a little bit speckled, but it wasn’t anything too bad. It smells good and produces a nice tan. $6.00 per ounce is a bit higher than average, but not too bad. To buy Xen Tan Fresh Tanning Mousse, Click Here. Look and Feel This is a white, fluffy mousse. Application Applying it is easy and clean, but make sure not to miss any spots! Smell (After) There was no DHA smell or citrus smell. Color Produced My tan was a natural medium shade. How Long It Lasts It lasted 4-5 days and then faded. Price It’s $6.00 per ounce, so slightly more than average.